The Roman gods are waging a war against a deadly army of stone warriors called Nirads. The gods’ battle is causing strong thunderstorms down on earth. The Flame of Olympus, the source of the gods’ power, is extinguished by the Nirads, causing the Olympians’ power to fade. Vesta, the Roman goddess of the hearth, has been keeping the Olympic flame lit, but is captured by the Nirads. Emily Jacobs, the main character, meets Pegasus when he crashes onto the roof of her apartment in New York City. Pegasus has been wounded by a Nirad spear, and accidentally hit by one of Jupiter’s thunderbolts during a battle, which sends him crashing to earth. 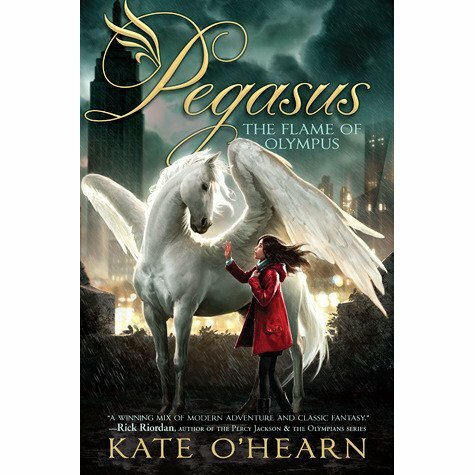 Paelen, an Olympian thief, was trying to seize Pegasus’ golden bridle at the moment the lightning struck. Paelen wanted to get away from the war, and Pegasus was his escape. He too is flung to earth, with Pegasus’ bridle still in his hands. He also ends up in New York. Paelen wakes up in a hospital with a tube in his arm. He has never visited the mortal world, so he has no idea what is happening. Officer Jacobs, Emily’s father, comes in to question Paelen, but has a hard time believing his story. At the hospital, Paelen is given a blood test, and one of the nurses sees the results, she calls the CRU: the Central Research Unit, a government agency that specializes in investigating reports of extraterrestrial sightings. They take Paelen, the winged sandals Mercury gave him when he died, and Pegasus’s gold bridle. Paelen is taken to a secret underground facility, where they say if you go in, you never come out. When the Nirads come to earth to track Pegasus down, Emily has to find a way to protect Pegasus and get his bridle back. The Nirads want to kill Pegasus because he is the only being that can defeat them. Pegasus’ bridle and his horseshoes are made of Olympian Gold, the only material that can harm them. Emily and her friend Joel receive some help from Diana, the Olympian goddess of the hunt. However, Diana needs Pegasus’ bridle to help defeat the Nirads. Diana teaches Emily and Joel about the secret line of Daughters of Vesta, and how they carried the Heart of the Flame of Olympus inside them without ever knowing it. The Heart of the Flame has passed down from mother to daughter through the ages. Pegasus tells Diana that she believes the current Daughter of Vesta is in America, and very close. The Daughter of Vesta must “willingly sacrifice herself to the Flame.” In other words, she’s got to die to return power to the gods. But who is she? Fans of the Harry Potter books and movies, or anyone who enjoys ancient Green and Roman myths and legends will enjoy this captivating, adventurous, and intriguing book. The story is also very similar to the Percy Jackson books, by Rick Riordan. In fact, Emily Jacobs is a lot like Percy Jackson and Harry Potter themselves, in more than one way! However, unlike Potter and Jackson, she is a girl. Pegasus: The Flame of Olympus is a great book for readers who like a strong, young female hero. But this is not really a book “for girls” (or a “book for boys”). This is a book for anyone who likes a good story. This is the first book of a 6-book series, for readers ages 8-14. Enjoy! Daddy's afterthoughts: So, this is a "thing," Young Adult titles re-telling (I think the word of choice these days is "appropriating") existing canons' stories and re-casting their characters. When Julia was younger, she read tons of books that did this with fairy tales: modern re-tellings or re-imaginings of classic fairy tales and Disney tales, like Sarah Mylnowski's Whatever After series of books, which are good for younger readers, maybe ages 8-10. FWIW, she still reads and loves the Land of Stories books written by Chris Colfer (yes, from Glee, that Chris Colfer), which follow the adventures of twins Alex and Conner Bailey "as they fall from the real world into a world full of fairy tales they have only ever read about before and discover there is more to this world than meets the eye" (thank you, Wikipedia). And not only do authors appropriate classic fairy tales, they are breathing new life into the pantheons of (mosty Greco-Roman) gods and goddesses as well. Aside from the aforementioned multi-hundred-page works by Kate O'Hearn and Rick Riordan, there are sets of slightly shorter titles for younger readers as well. Julia particularly likes the Goddess Girls books by Joan Holub and Suzanne Williams. There are 23 books in the series as of Spring 2017, and Julia has read 10. Will she continue in the series? I'm sure she will post about it if she does. Simon and Schuster rates them at a 3rd to 7th grade reading level, and she is entering 7th grade shortly, so who knows. As a teacher, I can't help but feel that such early introductions to these classic figures and pantheons is probably a good thing, even if they are morphed into something that scarcely resembles anything Ovid would recognize. Goddess Girls books, for example, are like a cross between Harry Potter and Percy Jackson: "Athena always knew she was smart and special, but she didn’t realize that she was a goddess! When she’s whisked away to Mount Olympus Academy, she worries about fitting in and dealing with her dad—who just happens to be Zeus." - Synopsis of book 1 in the series, Athena the Brain. Athena always knew she was smart and special, but she didn’t realize that she was a goddess! When she’s whisked away to Mount Olympus Academy, she worries about fitting in and dealing with her dad—who just happens to be Zeus. Wow, Julia! This is such a great resource. You have a knack for this. Keep it up!